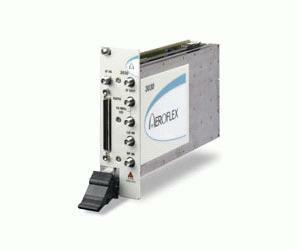 The Aeroflex 3030 is a precision broadband RF digitizer module in a compact 3U high, two-slot wide PXI package. Used in conjunction with the 3010 RF synthesizer, the 3030 frequency down-converts and digitizes RF signals of up to 20 MHz bandwidth from 330 MHz to 3 GHz. It offers high linearity and low noise performance. It is ideally suited for the analysis of radio signals—including 3G WCDMA. The combined package of 3030 and 3010 occupies just three slots in a 3U-high PXI rack . The 3030 RF digitizer outputs a set of amplitude- and phase-corrected digital IF or IQ data samples with an amplitude accuracy of typically 0.3 dB. These samples are processed in the system controller using application software in conjunction with the 3030 VXIpnp driver.